Today I wanted to show you that you can do mixed media (which face it, is really popular now and spilling into everything!) in a CAS (clean and simple) style! When I first started seeing and hearing about mixed media I resisted - after all, I thought it was all grunge and sponge and that just isn't me. But, then I started paying more attention, looking at other mixed media artists and finding out that it's really all about combining things you love and using anything that inspires you! I used some of the new Pink Paislee She Art products that are in the eP store. This is a line of products designed by Christy Tomlinson - love her style! I used the new Vintage Doily Mask (which will be in the store tomorrow- heehee, you're getting a sneak peek! ), it's a big, beautiful mask that will go with everything!! 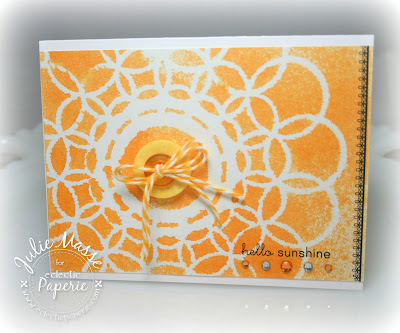 I simply layed the mask over my paper and sprayed it with Pure Sunshine baby (Ink Spray that is)! Love it! I then pulled out the new Border Rub-ons from the same Pink Paislee She Art line and added a simple black line down one side for a bit of contrast and grounding. Since the sentiment is black it all seems to flow. I added 2 stacked buttons tied with some Lemondrop Twine and a bit of bling (why now?!) - done! There you have it, mixed media a la CAS style! Wouldn't this be so pretty do with all different colors of ink sprays?! Oooooh, I might have to shop for more colors, think pretty chartreuse green, bright pink, turquoise . . . FUN!! Have a great day my friends! I try to be CAS, I start out that way and then I can't stop LOL....I wish I could... you make the nicest cards...love em!!! Julie this brought a smile to my face tonight...beautiful card and soooo effective!! CAS mixed media... who knew?! Fantastic make, Julie! gorgeous card! That color is just yummy and the pop of black is perfect! Wow...just a wonderful card. Great way to say POW with a CAS design! Well if this doesn't look like sunshine nothing does. So beautiful and happy!!!!! This card is so happy! Love the vibrant colour, the cool stencilling, and the mixed media touches. Great design!